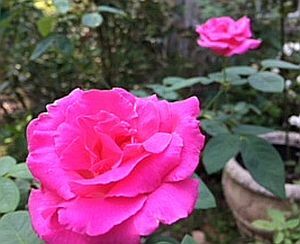 At a recent Master Gardener symposium, Dr. Kiki Fontenot, Horticulture professor at LSU AgCenter, talked about eating flowers from the garden. While I thought I knew a little something about which flowers I can eat, Dr. Fontenot inspired me by talking about some unexpected flowers and plants I had no idea were edible. Whenever eating flowers and plants always make sure they are edible and that you have purchased organically grown plants or those grown without harmful chemicals. Here are a few of the flowers she talked about. I have added a few others that you may or may not know about. Of course. there are many more that you can research and explore on your own. Rosella the edible Hibiscus or Wild hibiscus (Heterophyllus sabdariifolia) which are deep red. Make tea by boiling the flowers and let steep for 20 minutes, strain for tea and add cinnamon. Used to treat a number or ailments from gout to hypertension and weight loss. 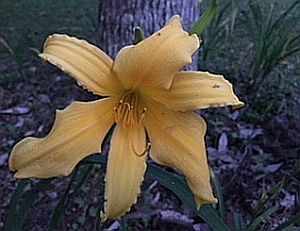 Daylily is another surprise flower as the entire plant is edible. Kiki said to boil the tubers. It can be a laxative. Use opened buds as a green bean substitute. Open flowers can be eaten raw or fried. Dried flowers are used as herbs to enhance flavors. Sautee unopened flower buds in butter, garlic salt and pepper. Nasturtium is a lovely flowering plant that is entirely edible. This running plant is used as a ground cover and has pretty red, yellow, orange blooms that have a peppery taste. Used in salads, stir fry. Cook with pasta and stuff flowers. Squash blossoms are lovely and edible, generally the zucchini squash but other squash blossoms can be eaten in salads, dipped in batter, stuffed with savory or sweet fillings, fried as well as other ways. Blossoms taste good cooked or raw. Pansy is a good edible flower. Also use because the flowers are pretty and colorful. Use flower petals in salads and in sweet dishes, candied on cakes and in drinks. Roses can be used in some of the same ways we use pansy. Rose hip tea, rose water are popular uses for rose petals. candied rose petals. In cakes and salads. Okra is a great garden plant for warm and hot climates. In addition to the okra pods for cooking, you can enjoy the leaves of okra both cooked and raw. Used as a natural way to thicken soups and stews. 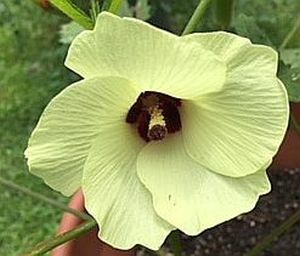 Okra flowers are not only very pretty but also be cooked into a nutty asparagus-like flavor. Some people use the ground okra seed flour in breads and other dishes.